Varedan has a long history of providing extremely reliable high performance analog linear servo amplifiers for OEM customers. 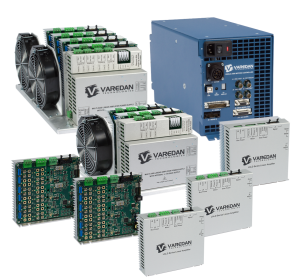 Following that tradition, Varedan’s Intelligent Analog Linear Servo Amplifier extends our product offerings to include advanced digital controls and simple to use PC based VaredanGUI™. The analog current loops(s) are designed for ultra-low current drift, in the range of micro amps per degree C. Furthermore, Varedan’s proprietary circuitry provides gain switching to allow very accurate low-level current (<500mA) control. The Varedan Intelligent Linear Servo Amplifier offers Varedan’s existing high performance analog linear servo amplifier technology with our new digital control platform that supports single phase for voice coils or brush-type motors, ABSine 2phase external commutation for 3-phase motors, internally commutated current mode, velocity or position mode operation. Feedback options include standard incremental quadrature to modern absolute digital systems such as BiSS and EnDat. The PC based VaredanGUI™, with it’s built in command stimulus and real time oscilloscope signal tracer views, reduces the requirements for external equipment while setting up new systems. The standard Ethernet based communications easily connects with all modern computers. Full system configuration can be saved and uploaded for quick and easy drive provisioning.